Amond DVD to Zune Converter is extremely easy to use DVD to Zune converter and DVD to Zune ripping software, which helps you rip DVD movie to Zune format, convert DVD to Zune video, with excellent image and sound quality. The DVD to Zune converter software also supports rip and convert DVD to Zune MP3, WMA, AAC importing to Zune Player. Free download Amond DVD to Zune Converter to enjoy Zune videos and audios right now! 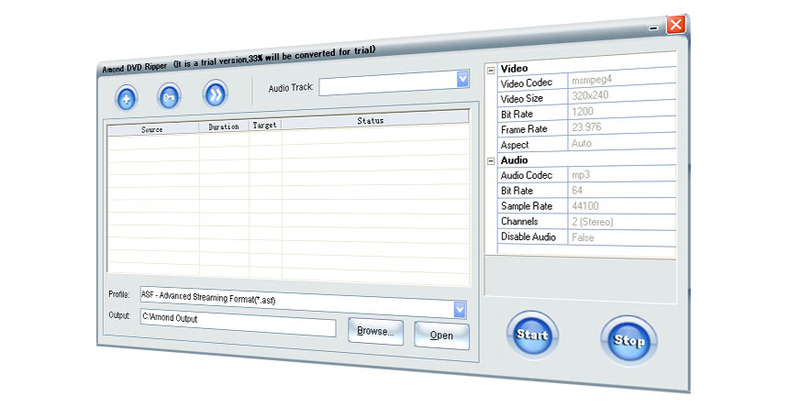 *Convert dvd to AAC-Advanced Audio Coding. *Convert dvd to MP3-MPEG Layer-3 Audio. *Convert dvd to WAV-Waveform Audio. *Convert dvd to Zune MPEG-4 AVC Video Format. *Convert dvd to Zune MPEG-4 Video. *Automatically shutdown computer after long time conversion. *Easy-to-use interface and support skin. *Allows you to select target subtitle and audio track. *Output profile is adjustable, It's suitable for veterans as well. Qweas is providing links to Amond DVD to Zune Converter 3.28.010 as a courtesy, and makes no representations regarding Amond DVD to Zune Converter or any other applications or any information related thereto. Any questions, complaints or claims regarding this application Amond DVD to Zune Converter 3.28.010 must be directed to the appropriate software vendor. You may click the publisher link of Amond DVD to Zune Converter on the top of this page to get more details about the vendor.